I will put together a custom marketing plan with an effective price. More than 50% of the homes currently on the market are overpriced. An overpriced home ends up sitting on the market for too long and often sells for a lot less than it should have. A strategically priced home often generates competing offers and drives up the final sale value. My market analysis takes into account the most actively searched prices and home values throughout the area, including expired listings and properties still on the market. I will come up with the most strategic pricing to ensure you receive top dollar for your home and in the shortest amount of time. Most of my listings receive an offer in the first 3 weeks and at top dollar! When marketing your home I develop a listing that emphasizes its unique and sellable features. I then put your home in front of 100's of buyers, thousands of agents on the MLS, new listings sheets, and well known real estate publications. The Re/Max nation-wide network of professional real estate contacts and qualified buyers will also have the opportunity to see your listing. Over 95% of buyers start their homes search on the Internet. I have designed the most innovative web sites in the area that reach thousands of potential buyers. The most important concern as a sellers is making sure your agent has an innovate and effective Internet marketing strategy. My award winning marketing is second to none and this type of marketing strategy you can't afford to miss. 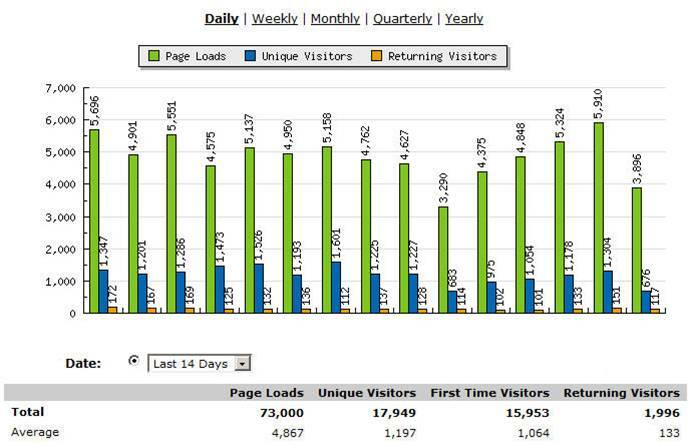 Just take a look at a sample of my web site traffic over a 14 day period, unmatched by any web site in the area! When I list your home, I do so with the intention of getting you the best possible price. When you start to get offers, I represent you during the emotionally charged negotiating process and ensure that you get the best price, and favorable closing terms that are clearly spelled out. As your professional aide, I also oversee all paperwork related to the sale. Here is just a small sample of what happens the first week your home is on the market! Professional photo shoot of your home for the MLS and property web sites. Promote your home at marketing sessions and place you home on our weekly Realtors’ Home Tours. Promote your home through social networking avenues; LinkedIn, Twitter, Facebook, Pinterest, Google+ Plaxo, etc. Syndicate listing to real estate web sites such as: Realtor.com, Frontdoor, Trulia, Yahoo, Google, Zillow, Vast, etc. Create a listing ad and submit to Internet classifieds web sites including Craigslist, Backpages, etc. Showcase your home on Realtor.com with an enhanced showcase package. Local partner promotion - property e-card mailed out to mortgage brokers and loan officers. Send out just listed postcards to targeted homeowner lists in the area. Market home through targeted real estate, high traffic blogs. For most of people, your home is your biggest investment. When it's time to sell, get the value you deserve with the help of a professional real estate agent. If you'd like to discuss your next home sale today, please contact me anytime.